Here is a very simple application to back up apps on your android device in bulk. App Manager is designed to be a simple to use app for Android users to back up their apps in bulk or one-by-one. In addition, it has also a provision to uninstall apps in bulk (batch uninstall). App Manager also gives extensive information about each app. App Manager has a very easy to use interface. After installation, just check the applications you want to back up or hit check all option for batch back up, and then tap backup. Your apps are safely backed up onto your SD card. Save the backed up apps on your computer for safekeeping. For that, connect your phone to your PC and go to your SD card – Android – Data –burrows.apps.appmanger using Airdroid or USB Cable and copy and save the folder on your PC. Even though you can backup in bulk you will have to restore applications one by one. Mindjet is a free mind map program with a tiny bit of nagware asking you to upgrade to the enterprise edition of the software which is not needed if you only use every so often. To get the most out of this software you should have Mindmap software installed on your desktop such as Freemind and creating the initial mindmaps there and transferring them to your android device to use in Mindjet. • Drag and drop topics. • Various topic styles with simple gestures. • Add icons and images for context and detail. • Create relationships between topics. • Add attachments and hyperlinks to supporting files and web pages. • Gesture shortcuts – draw shapes in order to execute various commands. • File tagging for easy organization and search. • Support for keyboard shortcuts. – Manage applications such as backing up and importing them. 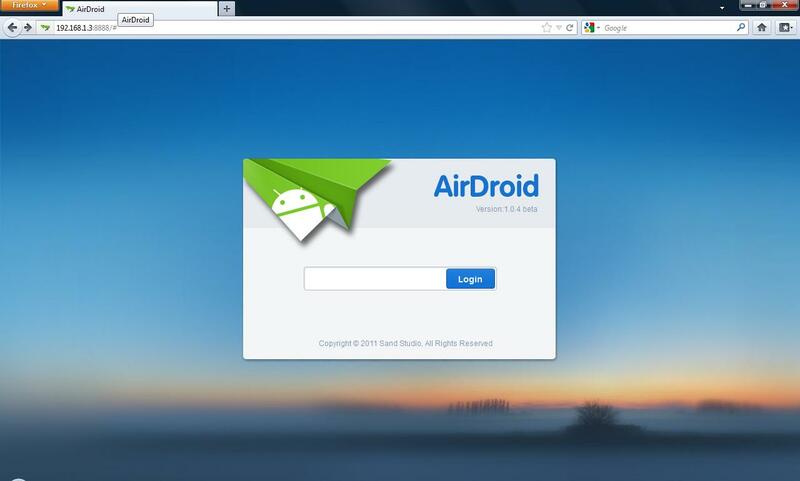 AirDroid is free to download and use and does not included any nagware to bother you. Once installed launch the AirDroid app and you will be shown a first time intro screen just scroll left and tap the start button on the second screen. Tap the start button and the next screen will show you the IP address to put in to you browser and the password you need to put in. 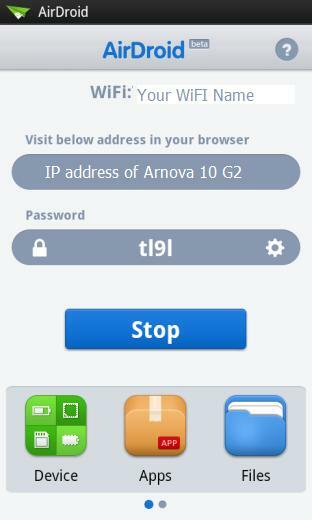 Enter the password you were show on the arnova 10 g2 screen and should be shown the airdroid interface which shows folders and statistics about your own Arnova 10 g2 device. Click the files icon on the airdroid interface to view the contents of the SD card on the Arnova 10 g2 this is an easier way to clean up the Arnova 10 g2 then the file manager supplied with the tablet. Use the import app button to upload an APK file into the Arnova 10 g2 from your computer to install Apps not your computer you will need to use android market by clicking the market icon. It is import to note you will have confirmed each app removal and installation on your arnova 10 g2.